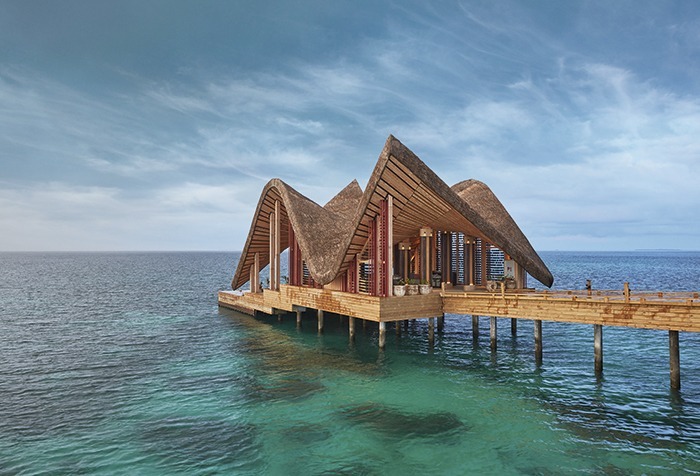 Turkish developer Gürallar tasks Autoban with the design of its debut resort in the Maldives. When it comes to first impressions, Joali, the debut Maldivian property from Turkish company Gürallar, certainly knows how to make an impact. For starters, the arrival jetty with its undulating thatched roof, said to be inspired by the rise and fall of the ocean, rests almost ecclesiastically on the bluest of waters. Second is the resort’s architectural blueprint – masterminded by Cüneyt Bükülmez of Istanbul-based firm Atölye4N – which is defined by a 1.3km boardwalk that snakes out into the ocean as far as the eye can see. Located on Muravandhoo island on the Raa Atoll in the northern Maldives, the result is an intimate, considered property that is shaped by the natural landscape. 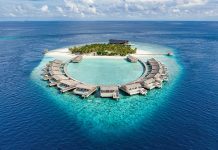 For example, Bükülmez says the boardwalk is determined by the contours of the surrounding coral, with the over-water villas only appearing after a lengthy 300-metres so as not to disturb the circulation of the water’s current. “We worked with local architects and an official advisor, who directed us towards the right places to build,” he explains. In contrast, the modern interiors are entirely befitting to the Joali brand, which places a sophisticated and confident feminine spirit at its core. 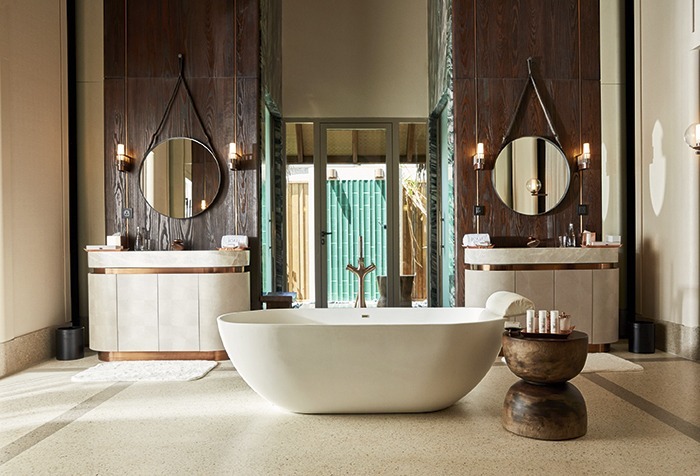 As such, the Istanbul-based firm Autoban has layered the 73 capacious villas with custom-made furnishings, organic curved shapes and tactile materials, such as terrazzo flooring, rattan-lined ceilings, bottle-green marble and hand-carved wooden panels inspired by the work of Romanian sculptor, Constantin Brâncusi. Beach and over-water villas – some with private decks and infinity pools – make up the majority of the key count, while the three-bedroom Private Ocean Residence boasts almost 1,000m² of indoor and outdoor living space as well as two pools, butler service and an on-call dhoni to whisk residents to the main resort. The graceful colour palette is dominated by neutral tones, which shine through in blush pinks and copper details, while blue and green accents highlight the colour of the sea outside. 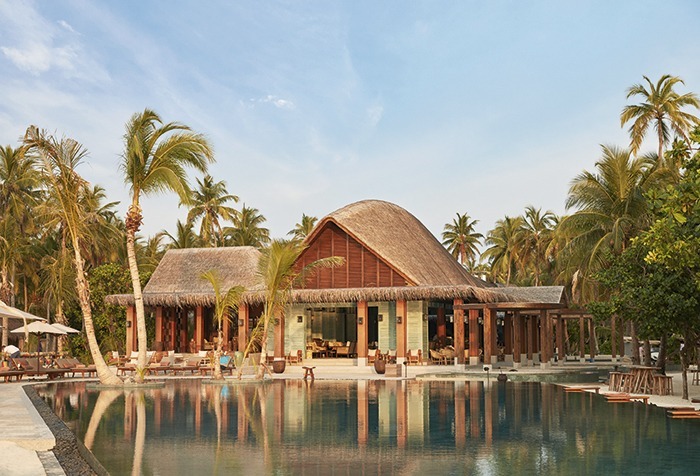 The theme continues to the resort’s airy and open public spaces, which – particularly at Vandhoo, the main restaurant – have been given a dramatic boost with details like wooden abacus separators, and bamboo ceiling beams, from which a cluster of basket pendant lights hang. 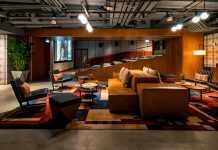 “We really enjoyed the challenge of understanding the Maldivian spirit, the exotic climate and the island culture while creating a unique story with local materials and techniques, in a contemporary way,” says Autoban founding partner, Seyhan Özdemir Sarper. Tokyo-based Studio Glitt – the firm behind numerous Zuma restaurants from London to Abu Dhabi – meanwhile, is behind Saoke, the resort’s over-water Japanese restaurant. Here, its founder, Noriyoshi Muramatsu took his cues from a Japanese garden floating on the sea. 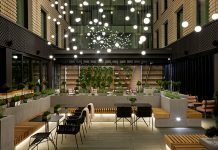 This translates to swathes of timber and low-key concealed lighting that highlights carefully composed rocks, open water channels and a ceiling constructed from a jumble of wooden blocks that creates a dramatic Jenga-like effect. Arguably the best spot to indulge in one of the famous Maldivian sunsets, the restaurant has been smartly assembled so that all the tables face towards the view. 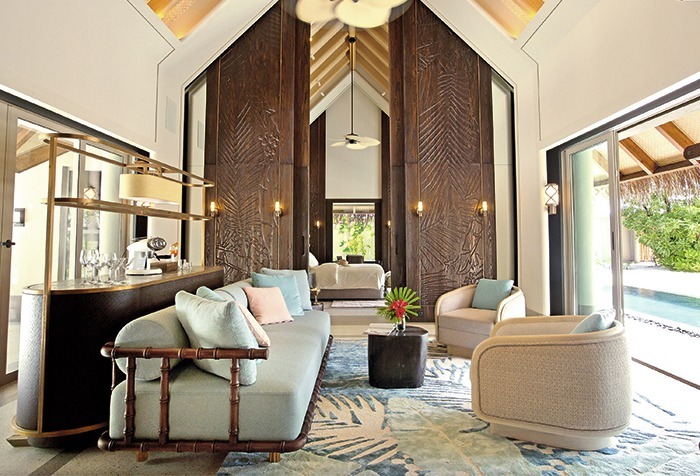 “It was important to create a design that does not overshadow the beauty the Maldives has to offer,” explains Muramatsu. Of course, along with the resort’s four main restaurants, which includes Italian eatery Bellinis, are a range of immersive experiences, from personalised culinary classes for guests to learn how to cook local Maldivian recipes, to a liquid nitrogen ice cream bar and artisanal chocolate store. 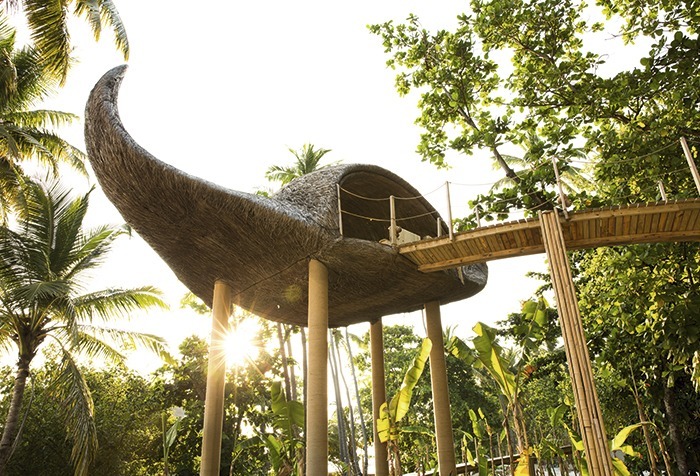 There’s also a community table designed bespoke for Joali by American artist Misha Kahn, and a private dining space housed within the Manta Ray Treehouse, a dramatic sculpture perched among the treetops created by Cape Town-based artist Porky Hefer. The art is, in fact, one of the highlights at Joali. Curated by duo Zeynep Ercan and Asliala Onur of Istanbul-based outfit NoLab, specially commissioned pieces by an international roster of artists – from Nacho Carbonell to John Paul Phillip – can be found casually dotting the island with the aim, as the duo say, to “create an immersive experience”. US artist Chris Wolson’s playful terracotta chairs, for example, sit nonchalantly outside the gift shop, a colourful ceramic corral-like sculpture by LA-based Israeli artist Zemer Peled takes centrestage in the spa, and glass objects by Istanbul-based artist Feleksan Onar can be found in the guestrooms. If that weren’t enough, diversions include snorkelling with manta rays, wakeboarding, and chartered yacht and dhoni excursions. Although, the best spot in the house is with a cocktail, besides the inky pool, whose organic shape has been defined by the seductive curves of the island.